Are you looking for a way to introduce co-sleeping to your family? Then you may be interested in the product we are reviewing today, the Dream On Me Karley Bassinet. The Dream On Me Karley Bassinet is made of a polyester foam fabric. It features a double canopy and 1 inch thick mattress pad. Lightweight and versatile, this bassinet can easily be moved from room to room. It is easy to assemble, and quickly folds up for when you need to travel with it or store it. This product can be used for babies up to 25 pounds. A nice feature is the storage basket underneath, which can be used for storing your child's blankets, toys, and other baby supplies. The dimensions are 35.5 inch x 18.3 inch x 47 inch. The Dream On Me Karley Bassinet comes in a large variety of colors. In order for you to purchase the product that will fit your needs, you will need to ask yourself a few questions. To help you get started, I've included a list below of some simple considerations to keep in mind while purchasing the Dream On Me Karley Bassinet. How Old Is Your Baby? The first question to ask yourself is how old your baby is. The Dream On Me Karley Bassinet is recommended for infants up to 25 pounds. Once your baby is over the weight limit, you should transition him or her to a baby crib. Keep in mind though that the pink colored bassinet will only hold babies up to 10 pounds. All the other bassinet colors will hold 25 pounds. Just keep that in mind when purchasing this product. How Much Money Are You Willing To Spend? Consider how much money you are willing to spend on a baby co-sleeper. The Dream On Me Karley Bassinet is at an affordable price. Many co-sleepers without as many features are much higher in price. If you are on a tight budget, this product is a good choice. Do You Want a Co-Sleeper That Gets Placed On the Bed Or Beside the Bed? This type of co-sleeper is a bassinet, which means it is made to get placed beside the bed. However, there is a number of other types of co-sleepers, including sidecars, co-sleeper pillows, and co-sleepers for toddlers. If you are wanting something that gets on the bed, you'll want something different than this. Consider what will fit your needs the best. Are you considering co-sleeping with your baby? If so, you may want to consider trying out the Dream On Me Karley Bassinet. The Dream On Me Karley Bassinet is the perfect option for those who want to be close to their babies, but don't want to worry about rolling onto them. This product is lightweight, which allows you to easily move it from room to room. If you take the bassinet outside, the canopy is there to protect your baby from the weather. This baby co-sleeper is breathable, so you won't have to worry about your baby suffocating. The Dream On Me Karley Bassinet has a storage basket underneath, which allows you to store your baby's supplies close to where your baby is. Some customers stored diapers in the storage basket so that they could easily change their child's diaper during the night. Other supplies that could be stored in the storage basket are blankets, toys, and and pacifiers. If you are wanting a cheap co-sleeper, this product is a good choice. It is much cheaper than other co-sleeper options. In addition to being affordable, this product also has more features than other co-sleepers have. The canopy and storage basket are unique features that not all bassinets have. The first major negative feedback that the Dream On Me Karley Bassinet received is that the mattress is thin. According to the product description, the bassinet pad is only 1 inch thick. Customers were disappointed in how thin the mattress is, and wished it was a little thicker. The second con that the Dream On Me Karley Bassinet received is that the canopy is not removable. Although some customers loved the canopy, others did not find any use for it. The only way for the canopy to be out of the way is if you unzip it. However, the canopy will always be there and there is no way to remove it. Finally, customers did not like that the canopy falls down when it isn't zipped. When you unzip the canopy to take your baby out of the bassinet, the canopy quickly falls down. When it does this it could easily hit you or your child. Customers wished that they could control when the canopy stays up or goes down. Are you needing an inexpensive co-sleeper bassinet so that you can safely co-sleep with your little one? Consider trying the Dream On Me Karley Bassinet. The Dream On Me Karley Bassinet is made to be placed beside the bed instead of on the bed. It comes in a variety of colors, and it has many unique features. Such features include the storage basket, which is used for storing your baby's supplies, and the canopy, which can be used for protecting your baby from the sun. Keep in mind that the canopy cannot be removed. Some customers did not like this. However, it can be unzipped so that it is as though the canopy is not there. A lot of customers did complain about the bassinet pad being thin. It is only 1 inch thick, which is rather thin. You could always add extra blankets so that it is more comfortable for your child, but it would still be nice if the mattress was thicker. Another con that this product received is that the canopy falls down when it is unzipped. When it does this, it could hurt you or your child. To prevent it from hitting your baby, when you unzip the canopy try to hold it so that it doesn't slam down. The Dream On Me Karley Bassinet has many unique features and benefits that other co-sleepers do not have. One of its biggest features is that it gets placed beside the bed instead of on the bed. There are also lots of small features that make life easier, such as the storage basket underneath. In this section, let's take a look at some of the features and benefits that the Dream On Me Karley Bassinet has. This product is just over 14 pounds, which is lightweight for a bassinet. Not only is it lightweight, but it also folds up. This allows you to easily travel with it and store it. The canopy can be used for protecting your little one from the weather. Keep in mind that the canopy is not removable, but it can be unzipped. When you unzip the canopy, make sure you are careful and hold the canopy up so that it doesn't slam down and hit your baby. Many customers complained about the canopy falling down quickly, so be extra careful. "It's perfect! I know a lot of comments on previous reviews mentioned that the pad didn't come with sheets. Because my last baby died of SIDS while in a bassinet that has make shift sheets on it, tight fitting sheets were a must. Sheets for the Halo Bassinest work perfectly, they are tight fitting and they don't make the pad curl up. If you don't like the color choices for the sheets at baby r us, etsy.com has great choices." "This bassinet is great, my baby has been using it every night for 3 months. It makes nursing at night easier and baby sleeping in a bassinet in your room reduces the chance of SIDS. We even take it with us when we travel home to visit family and it folds down and fits easily in our small car for travel. We have two cats and I was worried about the cats wanting to cuddle with the baby. Especially our larger cat who is very cuddly and loving. I didn't want him to snuggle up with the baby. The only reason I gave this product 4 stars instead of 5 is because you need to buy a separate mattress because the one that comes with it is really bad. For the price I didn't mind at all getting a new mattress to go in it. We got a really nice $20 mattress to go in it and it has worked perfectly. As long as you're going in with the expectation of buying a mattress additionally you will not be disappointed with this product." "Words cannot describe how much I love this travel bassinet, but I will try. My family recently relocated across the country, and all of our worldly possessions are stuck in a moving cube that got lost in the shuffle and that we won't see for a MONTH. Thankfully, I ordered this and had it sent to my mom's before we moved as a little sleeping nest for my daughter when she visits grandma. Now that we've had to use it for her temporary bed, I'm really tempted to make this semi-permanent until she outgrows it. Here's why: Right out of the box it snapped together in 30 seconds without any extra tools, screws, etc. It lies almost completely flat when folded, and folds down easily. My daughter is 4 months, 15.5 lbs and 25 inches and she has PLENTY of room. Light as a feather!! The zippered hood gave us peace of mind around my mom's really lovable, curious cats at night. "The mesh sides are really breathable (our baby likes to mash her face against the side of her crib), but she can't get a hand stuck. The pad that comes with it is actually really padded, but not dangerously so. I read the other reviews that said the pad was just a hard slab, but was pleasantly surprised. It's more padded than her pack n play "mattress" for sure. I just covered it with a crib sheet in the photos. I can't think of a single minus, seriously. She still sleeps in our room at night, and I think I'm going to use this as a bedside/arm's reach bassinet. It takes up MUCH less space than her pack n' play, and she falls asleep soundly and deeply in this. It is a good height and depth to be able to reach her without hurting your back, too." If the Dream On Me Karley Bassinet does not fit your needs, there are many other baby co-sleepers for you to try. Today I'll go over three alternatives you may be interested in: The Arm’s Reach Concepts Cambria Co-Sleeper Bassinet, the Lulyboo Bassinet To-Go Premium Newborn Infant Baby Portable Play Mat and Travel Bed Co-Sleeper, and the Baby Delight – Snuggle Nest. If none of these alternatives fit your needs, check out the top ten best baby co-sleepers. The Arm’s Reach Concepts Cambria Co-Sleeper Bassinet features beautifully curved wooden ends. The linings vary by selection, but all feature a good amount of mesh for great breath-ability, as well as added visibility. This co-sleeper bassinet features storage baskets and side pockets, which allows you to store your baby's items close to where your baby sleeps. This side sleeper bassinet also features a side that rolls down, which enables you to reach over and draw your baby close to you during the night. The new design of this co-sleeper makes breastfeeding easy. It is very easy to assemble. The wheels on this bassinet makes it easy to move around from room to room. It measures 34" x 20" x 31". Although the Arm’s Reach Concepts Cambria Co-Sleeper Bassinet is the same type of co-sleeper as the Dream On Me Karley Bassinet, there are also many differences between these two bassinets. Let's take a look at their differences here. The Dream On Me Karley Bassinet is much cheaper in price. The Arm’s Reach Concepts Cambria Co-Sleeper Bassinet features a side that rolls down. This allows you to easily reach over and draw your baby close to you. The Dream On Me Karley Bassinet comes in a variety of colors. But the Arm’s Reach Concepts Cambria Co-Sleeper Bassinet only comes in brown and tan. The Arm’s Reach Concepts Cambria Co-Sleeper Bassinet has two storage baskets. The Arm’s Reach Concepts Cambria Co-Sleeper Bassinet is a great alternative to try if you are wanting something similar to the Dream On Me Karley Bassinet. It is more expensive, but it features two storage baskets and a side that rolls down. Find out more about this product by clicking here. The Lulyboo Bassinet To-Go Premium Newborn Infant Baby Portable Play Mat and Travel Bed Co-Sleeper is a soft, portable baby bed that conveniently folds into a backpack in a second for easy portability and storage while traveling. This multi-use bassinet can be used as a crib, co-sleeper, playpen, changing pad, or changing station. The 2-position canopy can be adjusted or removed to protect your baby from sun and wind. This co-sleeper is machine-washable. Included are two plush toys for your baby to play with. Unlike the Dream On Me Karley Bassinet, the Lulyboo Bassinet is a co-sleeper that gets placed on the bed. In addition to being used at nighttime, it can also be used as a playpen and changing station. Let's take a look at some of the differences between these two products. As I already stated, the first major difference is that the Lulyboo Bassinet is made to be placed on the bed, while the Dream On Me Karley Bassinet is made to go beside the bed. The Lulyboo Bassinet folds into a backpack very quickly. Although the Dream On Me Karley Bassinet folds and is portable too, it does not have this unique feature. The Lulyboo Bassinet features two plush toys for your baby to play with. 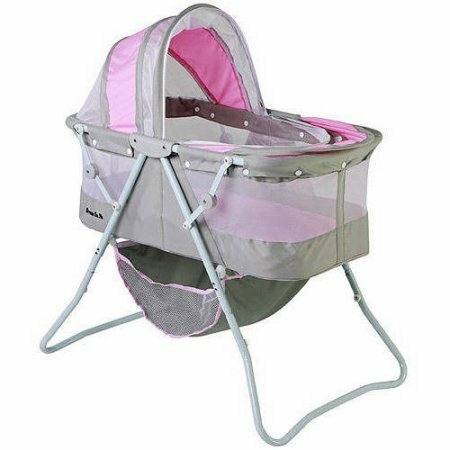 The Lulyboo Bassinet is higher in price. If you are looking for a portable baby co-sleeper, the Lulyboo Bassinet is a good choice. Similar to the Dream On Me Karley Bassinet, this product has a canopy that protects your little one from the wind and sun. It also folds into a backpack, which allows you to easily travel with it. The price is slightly higher in price though, but overall this is a great product to try. Click here to learn more about this co-sleeper. The Baby Delight – Snuggle Nest creates a separate sleeping space for your baby, and can also be used as a travel bed or daytime napper. This baby co-sleeper features Brahm's Lullaby and soothing womb sounds that help your baby fall asleep. In addition to this, there is a nightlight. Many customers liked the nightlight for helping them see when breastfeeding their child during the night. This baby co-sleeper features 5-level volume control and automatic shut-off, which allows you to set the perfect setting for your baby's comfort. The Baby Delight – Snuggle Nest folds in seconds into a small case for compact and lightweight portability. This baby co-sleeper has a quilted fashion cover with airy mesh inlay along the interior perimeter. It also has a waterproof foam mattress with fitted wraparound sheet. If you are needing a co-sleeper that gets placed on the bed, the Baby Delight – Snuggle Nest may be a good option. It has many unique features that the Dream On Me Karley Bassinet does not have. Let's compare these two co-sleepers and look at their differences. The Baby Delight – Snuggle Nest is made to get placed on the bed. The Dream On Me Karley Bassinet has a place for storage. Because the Baby Delight – Snuggle Nest is not a bassinet, it does not have this feature. The Baby Delight – Snuggle Nest features a nightlight and soothing womb sounds. Not many co-sleepers have this unique feature. The Dream On Me Karley Bassinet has a canopy. The Baby Delight – Snuggle Nest is an inexpensive co-sleeper that features soothing womb sounds and a nightlight. Many customers found the nightlight to come in handy at nighttime when they had to breastfeed their baby. Although it doesn't have a canopy or storage basket, it is still a great co-sleeper to try. To learn more about this co-sleeper, click here. The Dream On Me Karley Bassinet is made form polyester foam fabric. Featured is a double canopy and a 1 inch thick mattress pad. Because it is lightweight, it is easy to move from room to room. It also folds up quickly which is nice for when you will be traveling. It is made for babies up to 25 pounds. The storage basket underneath can be used for storing blankets, toys and baby supplies. The dimensions are 35.5 inch x 18.3 inch x 47 inches. The benefits of buying this bassinet is that it sells at a good price, it has a storage basket and it is lightweight and easy to move from room to room. Some negatives are that the canopy isn't removable, it has a thin mattress and the canopy falls down if it isn't zipped. I hope my review of the Dream On Me Karley Bassinet can help you decide if this is the right co-sleeper for your family! For more information, check out the rest of our co-sleeper reviews.